Unlock new information about your favourite characters from the Harry Potter movies with this definitive coffeetable book profiling the good, the bad, and everything in between within the Harry Potter universe. Dive into the personal journeys of beloved Harry Potter heroes, and an insightful look at the motivations and actions of the films’ most notorious and complicated villains. Perfect for any Harry Potter fan, The Character Vault takes a magnifying glass in order to closely inspect the individual look and style of each character in the movie series. With behind-the-scenes images and stunning artwork throughout, this book is a real treat to read. The Character Vault not only delivers all of the details about taking the character from the page to showing them visually onscreen, it also gives us an insight into the actors behind some our favourite characters and their journey to being part of the films. I thoroughly enjoyed getting to learn little facts that I hadn’t previously known, and it was interesting to discover the reasons behind certain design choices. So much thought was put into every little thing you see onscreen. My personal highlights from this book were the beautiful pieces of concept art and costume sketches. It’s so easy to forget how much preparation goes into even the smallest details of a scene. It also showed how scenes were eventually changed from the initial artwork, sometimes dramatically, and what led to that decision. 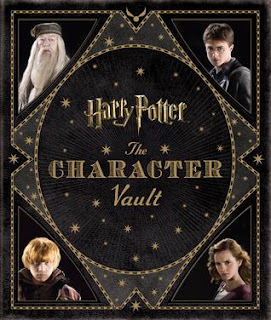 What was particularly special about The Character Vault was that it included certain details that the Harry Potter films never did. A lot of minor characters from the book series were cut from the final edit, including Peeves the ghost, which I was disappointed about. So I was thrilled to see that the book included the development art for his character, giving us a small glimpse into how he may have looked onscreen! This book also contains two gorgeous posters at the very back, one with images of Death Eaters, and the other with members of the Order of the Phoenix. They made for a lovely surprise once I reached the end. I thoroughly enjoyed reading The Characters Vault and I’d highly recommend it to all you Harry Potter fans out there. I loved the Harry Potter series! I'll definitely be adding this book to my Goodreads "to read" list. Thank you for the awesome review! I nominated you for the 2016 Liebster Award! For more info, visit The Reading Hideaway. Congrats and hope to hear from you soon!